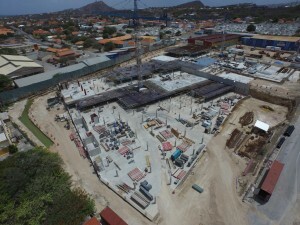 WILLEMSTAD – The construction of Hospital Nobo Otrobanda is progressing steadily. This is according to the financial institution USONA. The aerial photos taken in late June show clearly how the site at the Hamelbergweg looks now. First, it seemed that the construction would have been delayed because of a lawsuit against the Ministry of Urban Planning. Three organizations had objected to the continued demolition of the old hospital’s building. However, the court ruled that the demolition permits, which were appealed was not issued because this rule was not necessary. It was also decided that the importance of maintaining the buildings does not outweigh the importance of the Curaçao population to have, as soon as possible, a modern hospital that meets their medical needs.